Workflow Plug-in for Designing and Building Business Process Oriented Systems. 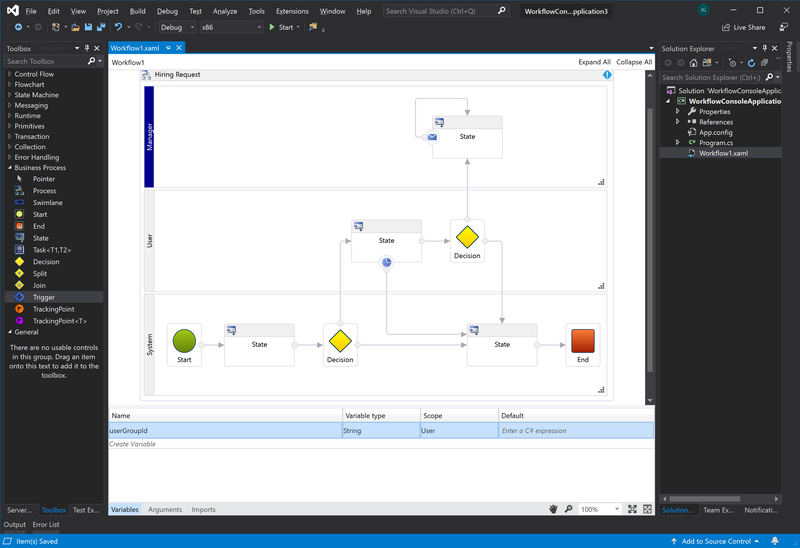 The BPM.NET for Visual Studio 2019 is a Visual Studioextension to Windows Workflow 4.0+. The purpose of the tool is to deliver thecapability of Business Process Management on the .net platform by leveragingthe power of windows workflow. This product can be used to work with BPM.NET Designertool to cover the life cycle of business process authoring. The BPM.NET for Visual Studio 2019 is fully built on top of WindowsWorkflow 4 and compatible with all the features provided by Standard WindowsWorkflow and Visual Studio such as Source Control, Debugging, TrackingParticipants, WCF and Workflow Sql Instance Store, etc. (if there is a problem when dropping the Process activity to the workflow designer, this could be possibly caused by the upgrade/downgrade of BPM.NET extension. Please try to do a toolbox reset by right clicking on the toolbox in visual studio) For more information, please see BPM4NET website: www.bpm4net.com.